Adel Mahmoodabad, H., Hokmalipoor, S., Shaban, M., Ashrafi Parchin, R. (2014). Effect of Foliar Spray of Urea and Soil Application of Vermicompost on Essential Oil and Chlorophyll Content of Green Mint (Mentha Spicata L.). International Journal of Advanced Biological and Biomedical Research, 2(6), 2104-2108. Hamid Adel Mahmoodabad; Saeed Hokmalipoor; Morad Shaban; Reza Ashrafi Parchin. "Effect of Foliar Spray of Urea and Soil Application of Vermicompost on Essential Oil and Chlorophyll Content of Green Mint (Mentha Spicata L.)". 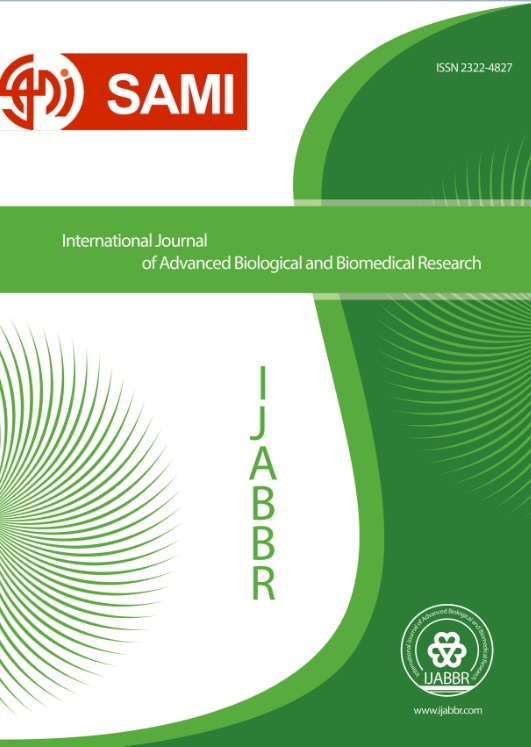 International Journal of Advanced Biological and Biomedical Research, 2, 6, 2014, 2104-2108. Adel Mahmoodabad, H., Hokmalipoor, S., Shaban, M., Ashrafi Parchin, R. (2014). 'Effect of Foliar Spray of Urea and Soil Application of Vermicompost on Essential Oil and Chlorophyll Content of Green Mint (Mentha Spicata L.)', International Journal of Advanced Biological and Biomedical Research, 2(6), pp. 2104-2108. Adel Mahmoodabad, H., Hokmalipoor, S., Shaban, M., Ashrafi Parchin, R. Effect of Foliar Spray of Urea and Soil Application of Vermicompost on Essential Oil and Chlorophyll Content of Green Mint (Mentha Spicata L.). International Journal of Advanced Biological and Biomedical Research, 2014; 2(6): 2104-2108. Essential oils from aerial parts of Mentha spicata, was obtained by steam destillation using a Clevenger-type system. These oils were screened for antibacterial and anti-Candida albicans activity using bioautographic method. A fiel experiments was laid out in agricultural research farm, city Namin, Ardabil province, Iran in 2013. Experiment was conducted in a randomized complete block with seven treatments and three replication. Foliar spray treatments urea solution at a rate of 1, 2 and 3% (in two stages, the first stage a month after transplanting when they had reached 10 cm in height to 20 days after the first stage and second stage ), soil application of vermicompost fertilizer at a rate of 5, 10 and 15 tons per hectare and control. Chlorophyll in two phases, one week after the first treatment and harvest samples were measured by chlorophyll meter SPAD manually. Essential oil extracted from the leaves and twigs using 50 g samples of each treated flower with water distillation by Clevenger apparatus was performed. Results showed that the effect of experimental treatments on essential oil and chlorophyll were significant at the one percent level of probability. maximum chlorophyll index foliar urea treatment 3 percent and the lowest was observed in the control. Most essential oils (114.3cc per square meter) in 2% foliar urea treatment and the lowest (36.9cc per square meter) was obtained in control treatment. An increase of over 300% in performance is seen to be essential.